Despite producing arguably the most dramatic game in Super Bowl history, Sunday’s Super Bowl LI event recorded the smallest viewing figures in four years. According to data released by Nielsen, an average of 111.3 million viewers tuned in to see the New England Patriots stage an unlikely 34-28 comeback against the Atlanta Falcons during the near four-hour broadcast of the NFL season’s climax on US broadcaster FOX. By contrast, pop sensation Lady Gaga drew a total 117.5 million viewers during the halftime show sponsored by Pepsi at NRG Stadium in Houston, Texas. 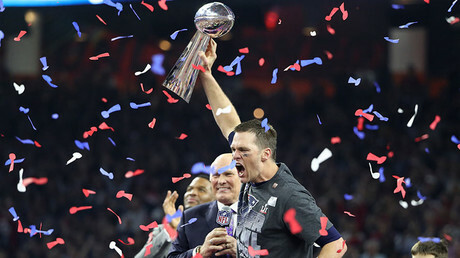 Despite the Patriots dramatically overturning a 28-3 Falcons lead to win their fifth Super Bowl, the viewing number is the smallest in four years. Last year’s Super Bowl drew only a fraction more at 111.9 million viewers, and the 2015 event attracted the largest viewership with 114.4 million, making Sunday’s game the fifth most-watched in television broadcast history. In all, the NFL’s showpiece reached a total 53.6 million US homes. Those viewers were also treated to commercials that cost $5 million for a 30-second spot. Many put the drop down to a drab game, which saw the Atlanta Falcons dominate the Patriots for the first three quarters before the Patriots rallied back to force the first ever overtime in Super Bowl history. The Super Bowl is accompanied by its eagerly anticipated halftime show, which traditionally features stars singers such as Bruno Mars and Beyonce. This year, it was Lady GaGa’s turn to wow the fans. And wow she did. Her 13 minute routine was watched by an audience of nearly six million viewers – more than the average for the actual game. It was reported that the pop superstar – who earns on average $1.3 million per city while on tour – was not paid to perform, as NFL protocol on halftime shows dictates that the league only cover the performer’s costs and expenses. Instead artists use the Super Bowl stage to boost sales of their records and tickets. For example, Bruno Mars and Beyonce saw revenue spikes of 92 percent and 59 percent, respectively, Forbes reports.